She argued in favor of local wisdom and community visions over the grandiose designs of distant planners. 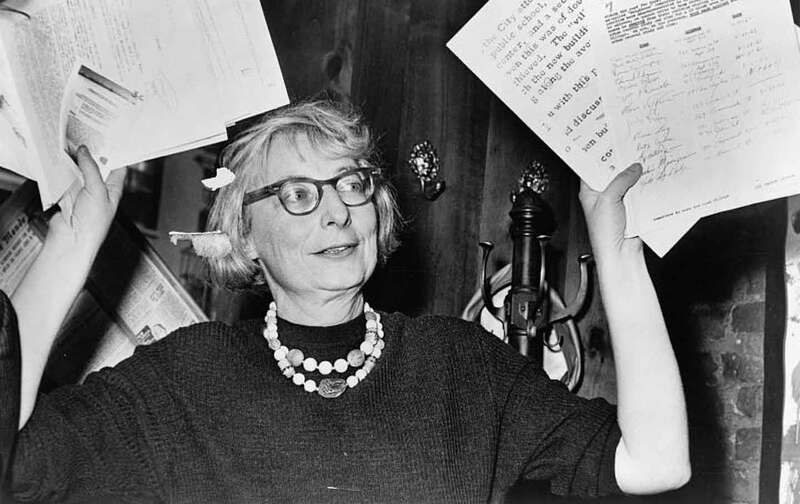 This year marks the centennial of Jane Jacobs’s birth. Her 1961 book, The Death and Life of Great American Cities, changed the way the world views cities. It has been translated into multiple languages and is considered one of the most influential books about cities in the 20th century. It introduced a new way of thinking about planning for cities at the high point of the demolition-derby days of urban renewal. The importance of street life, local plans, “eyes on the street,” mixed use, old buildings, transit, neighborhoods, diversity, and appropriate density are all mainstream ideas in urban design and planning today. They were revolutionary when Jacobs introduced them more than a half-century ago. Put down for not having a planning degree, let alone a college degree, Jacobs challenged “credentialism” in the same way as Ralph Nader, Betty Friedan, Rachel Carson, and Marshall McLuhan. Even though before her book was published, Jacobs had been writing articles about areas of the city for Vogue and architectural criticism for Architectural Forum, she was often referred to as “just a housewife.” It is frequently the outsiders of a field, often journalists, who wind up changing that field. “This is the role of the great amateurs: to see clearly the issues that academic specialists cannot see because they are limited by the blinders of their institutions and their disciplines,” observed Canadian journalist Robert Fulford in The New York Times in 1992. The consummate urban advocate, Jacobs is probably best known for helping defeat several projects promoted by New York City’s planning czar Robert Moses, such as the Lower Manhattan Expressway, which would have wiped out SoHo, Chinatown, and much of Greenwich Village. She didn’t hesitate to tell truth to power either in her writing or street protests. Above all, however, she considered herself a writer. Jacobs became world-famous for all of her seven books and is often referred to as the most significant urban thinker of the last century. It is not easy for uncredentialed people to stand up to the credentialed, even when the so-called expertise is grounded in ignorance and folly. This book turned out to be helpful ammunition against such experts. But it is less accurate to call this effect “influence” than to see it as corroboration and collaboration. Conversely, the book neither collaborated with car people nor had an influence on them. It still does not, as far as I can see. This is not false modesty. There is much wisdom in her words here. In my own observing and writing about the citizen-based rejuvenation of cities, I have witnessed as many efforts initiated and led by people who never heard of Jacobs as those led by readers of her books. Whether in urban downtowns or neighborhoods, or in suburbs or small towns, local residents and businesspeople know instinctively which improvements will bring positive change. When they have the means to pursue those improvements, or when new people come in and make improvements that harmonize in scale and use with the existing place, positive change occurs. Jacobs recognized this and argued in favor of local wisdom and community visions over the grandiose designs of distant planners and other so-called experts. Conflict arises when distant experts, developers, and city hall planners come up with schemes in which that local wisdom has not been brought to bear at the beginning of the process. Such schemes usually show little respect for the nature and built form of the community and then are presented at “public” forums, in what is deceptively called a public process. At that point, the plans are tinkered with and maybe an “amenities” package is added (a form of bribery to ensure passage even if inappropriate to the place). But the input of local stakeholders is nonexistent in the beginning and minimal at the end. This is when the total transformation and, often, replacement of a community occurs, not its genuine regeneration. The community’s plan, devised through a highly participatory process, did not prevail and, as she predicted, “visually tiresome, unimaginative, and imitative luxury project towers” have emerged, and continue to do so, to replace, not rejuvenate, the neighborhood. Jacobs never “prescribed” what change should look like. A genuine public process, with public input from the beginning, would arrive at the right point. She learned strictly by observation of what worked and what didn’t. She learned about street life in, among other places, her own neighborhood of Greenwich Village. She learned about the sterility and disrespect for residents in East Harlem public housing, the process of positive organic change in the East End of Boston, and the devastation of total clearance in the West End. She learned about the importance of old buildings in many places, and the necessity for economic diversity in Detroit and Rochester. Jacobs learned everywhere that there was something to be observed about every one of the threads in the intricate web that makes up the urban fabric.